This document pertains to HP Envy Notebook PCs with Beats Audio. Beats Audio is an enhanced audio controller that provides a deep, controlled bass (subwoofer) while maintaining a clear sound. Beats Audio is enabled by default. To activate Beats Audio, press fn+b . When the subwoofer is turned off, the beats icon will have a slash through it . To open Beats Audio and configure the playback and recording setting, follow the steps below. 1.Select Start , Control Panel , Hardware and Sound , HP Beats Audio Control Panel . Once you have opened Beats Audio for the first time, you can now search for it by typing Beats Audio in the Start menu search field. 2.Select the Playback tab in the top panel. In the left panel, you can do the following. Adjust the settings and equalization for Speakers and Headphones, Independent Headphones, and ATI HDMI Output. 3.Select the Recording tab in the top panel. In the left panel, you can do the following. 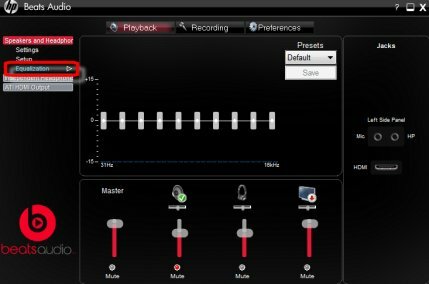 Adjust the settings for the Microphone, Integrated Microphone Array, and Stereo Mix. 4.Select the Preferences tab in the top panel. In the left panel, you can do the following.